New: Where to view Comet ISON’s encounter with the Sun. Comet C/2012 S1 was discovered in September 2012 by Russian astronomers Vitali Nevski and Artyom Novichonok using data from the International Scientific Optical Network (ISON). For that reason, it is also known as Comet ISON. This comet is on a close encounter with the Sun on November 28, 2013 (Thanksgiving day in the U.S.), when it will pass at a distance of only 2.7 solar radii from the center of the Sun. Since Comet ISON was discovered so far out, beyond the orbit of Jupiter, and will pass so close to the Sun, many think that this could turn out to be a major comet. A number of NASA missions, including STEREO, are planning an observing campaign to observe the comet as it passes by the Sun. Below, we discuss the view that the STEREO observatories (plus SOHO and SDO) will have of Comet ISON as it swings by the Sun. On a separate page, we discuss the observing strategies and anticipated science of the STEREO instruments. If Comet ISON works out as expected, the STEREO spacecraft should have a spectacular view. The movie below shows the geometry of the STEREO Ahead (red) and Behind (blue) spacecraft during the passage of Comet ISON (orange). The top panel shows the view from above looking down on the orbital plane of the planets (the ecliptic plane), while the bottom panel shows the view from the side. Note that the comet’s orbital path is highly inclined to the ecliptic plane. As the comet approaches the Sun, it comes in at a fairly shallow angle, but leaves at a much steeper one, carrying it well above the ecliptic plane. If one only looked at the top-down view, it looks like the comet passes close to the Earth around the end of December, but the view from the side shows that this is not really the case. . . . Read Complete Report with videos, photos and graphs. These images from NASA’s Solar Terrestrial Relations Observatory and the ESA/NASA Solar and Heliospheric Observatory show Comet ISON growing dim as it made the journey around the sun. The comet was not visible at all in NASA’s Solar Dynamics Observatory. The comet is believed to have broken up and evaporated. While this means that Comet ISON will not be visible in the night sky in December, the wealth of observations gathered of the comet over the last year will provide great research opportunities for some time. One important question will simply be to figure out why it is no longer visible. 11/28/13– Initially, scientists thought that Comet ISON disintegrated after its encounter with the sun earlier today. 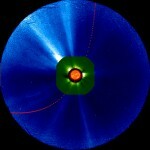 Now, some astronomers believe that remnants of the comet may have survived, as evidenced by imaging from the SOHO spacecraft. More at NPR and CBS News. Take a look at the STEREO Behind COR2 Video provided to Coast2Coast by Richard E. Hoagland.